March 5 is anniversary of the death of Franz Anton Mesmer (1815), born nearly 300 years ago (1734) but still spellbinding to this day. When we find ourselves mesmerized, perhaps by the champagne-glass shape of a courtesan’s bosom (see pompadour), we are invoking the memory of Franz Anton Mesmer, an eighteenth-century German physician whose controversial theories formed an early basis for hypnosis. History cannot quite decide what to make of Dr. Mesmer—whether he was a quack, a con man, or a visionary. In any case, he was born Friedrich Anton Mesmer in 1734 in Swabia, Germany, and studied medicine at the University of Vienna. The late 1700s were sort of an experimental free-for-all in European medicine. In 1774, Mesmer was able to convince a patient to create an “artificial tide” in her body by swallowing a solution of iron and then surrounding her with magnets. Mesmer attributed the “mysterious fluid” she felt coursing through her, and the subsequent relief of her symptoms, not to the effect of the physical magnets but to his own magnétisme animal. He was not referring to his powerful mojo. Instead, Mesmer believed in an ethereal medium that existed in animate beings that he could manipulate through animal magnetism, quite separate from mineral magnetism, cosmic magnetism, or planetary magnetism. Reports vary on how and how well this actually worked. In many cases, Mesmer would hold the thumbs of his patients, sit with his knees touching theirs, and stare into their eyes. For the next few hours he would alternately pass his hands up and down their arms and press on their lower abdomens. Convulsions were common. 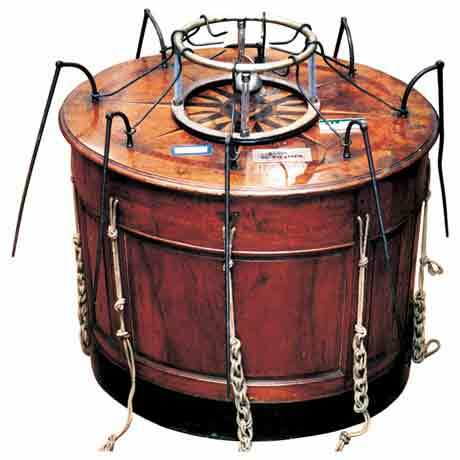 For those more interested in a group scene, Mesmer could accommodate up to twenty people at a time, all seated around a short vessel (called a baquet) studded with iron bars and ropes for each patient to complete the “circuit” and communicate between the baquet and the patients as Mesmer conducted his invisible fluid in a collective trance. This all went on for a number of years, with Mesmer now living in France amid divided opinion on whether he was a charlatan or a great physician. He caused such a stir that Louis XVI convened a French Royal Commission to determine if the supposed magnetic fluid was real. 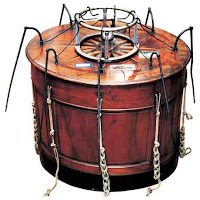 Included in the august group were then ambassador Benjamin Franklin, Antoine “Father of Chemistry” Lavoisier, and physician Joseph-Ignace Guillotin, whom history has inaccurately saddled with the invention of a mechanical death machine (see guillotine). While the commission could not find any evidence for the existence of Mesmer’s mystical fluid, they did not dispute the fact that his treatments were effective. Unfortunately for the good doctor, however, they asserted that his cures were more than likely due to the imaginations of his patients. Mesmer was never vindicated, though subsequent “mesmerists” developed further techniques for suggestion-induced trances, leading to the development of modern hypnosis in the midnineteenth century, many years after Mesmer died in relative obscurity in 1815. Though current practitioners would dispute Mesmer’s belief that a hypnotic trance is mediated by “animal magnetism,” some American settlers thought it seemed reasonable. One account for the naming of Mesmerizer Creek, Texas, is that an early resident struck on a novel way to domesticate American bison—through hypnosis.